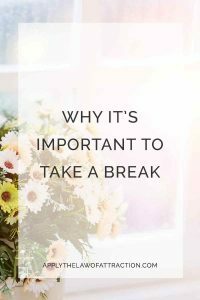 In both life and the Law of Attraction, sometimes it's important to take a break. It isn't about avoiding responsibility or giving up on our dreams. Sometimes we just have to take care of ourselves so that we can be at our best. We need to take some time and space from work, certain people or things so that we can see things clearly and remember what we used to enjoy about them. If we delay taking a break, we can get cranky and tired. We can even start to resent people around us and the things we need to do. Breaks allow us to recharge. They improve our energy, our alertness, our concentration, and our happiness. And because the very basis of the Law of Attraction is to have fun and enjoy life, any time the Law of Attraction begins to feel draining, like work, like something you have to do, it's time to take a break…reassess and start fresh. We need to listen to our inner voices and give ourselves the time and space we need. And that's why I'm going to be taking a break for a few weeks. In the past, I've had articles written ahead of time, allowing me to continue providing you with helpful Law of Attraction resources while I was away. However, I haven't managed to do it this time. Quite frankly, I'm burned out. I started this site over 6 years ago and I never expected it to become the sensation that it has. I am truly glad to have been able to help so many people, and I do love hearing your success stories. But each week, it's getting harder and harder to put in the countless hours it takes to write an article, let alone manage this site. I noticed I was getting burned out a couple of months ago, which is why I stopped responding to questions in emails and comments. I was spending more than 40 hours a week trying to help everyone. It was just too much. Not responding to questions helped for a little bit, but it really seems like I need to take a few weeks off to rest and recharge. I have a lot planned in the coming months and next year – a new site design, courses to help you have more in-depth and hands-on instruction, and so much more. So this isn't goodbye…just a short break. There are more than 250 articles on this site to help you while I'm gone. Take your time to read them and the comments. There's a good chance you may find your question has already been answered. We will miss you greatly while you take your break, but I 100% agree with you. We all need breaks from time to time and I hope to get one soon too. Enjoy your time off, and look forward to hearing from you again! Have a wonderful break! I hope you feel refreshed and ready to return soon! We appreciate everything you do for us. I know I have seen tremendous results in my life and relationship as a result of your support. You deserve a vacation/break! We all do 🙂 You help so many all the time, you need to take care of YOU too. I am grateful for all the posts you post and the replies you have sent me in the past. Take all the time you need, we will still be here! Elizabeth, your work is greatly appreciated. I know it is not an easy task. You have been such an inspiration to me and everyone else. Thank you! I really like what you said about taking time away from people and things to rediscover what we appreciate about them. Have a wonderful break and thank you for everything! Thanks everyone! All your comments mean a lot to me. Just wishing you a wonderful break, you deserve it!